Preheat oven to 425 degrees. In a small saucepan, heat cranberries, ¼ cup water and 5 tablespoons honey to medium-high heat. Bring to a simmer and allow to cook about 4-5 minutes, until cranberries just start to soften and mixture has slightly thickened. Remove from heat. Trim a small slice off each side of the pears. Cut in half lengthwise. Hollow just the center of the pears with a melon baller or spoon, creating a cavity for filling. Rub each pear with lemon juice. Bake 17-20 minutes, until just tender (if pear is ripe, it will take less time to cook). In a small bowl, beat goat cheese and remaining 2 tablespoons honey with a hand mixer until smooth and creamy. Place a spoonful of goat cheese mixture into each pear. Place a spoonful of cranberry mixture into each pear, next to the goat cheese mixture. In another small bowl, mix together oats, walnuts, cinnamon, melted butter and brown sugar. 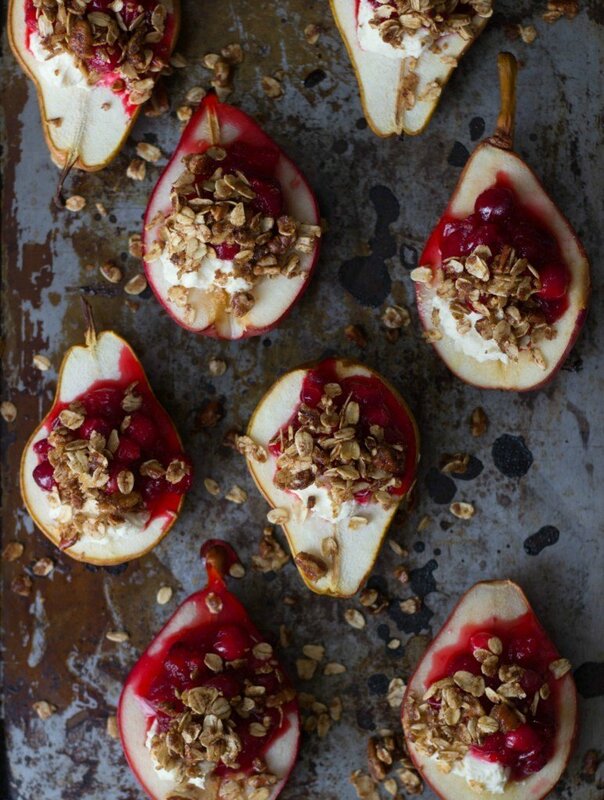 Place a spoonful of oat mixture on each pear. Serve with a sprinkle of cinnamon.